A few steps to the beach! Beautiful 3 Bedrm Oceanfront Condo in Premier Resort!! 3 Bedrm/2 Bath Ocean Front Condo! 3 br/2ba Beautiful Oceanfront Condo in Resort Area with 2 pools plus a kiddie pool and an on-site oceanfront restaurant/bar. $2,750/wk during summer months & $245/nt during the winter. Our 2 bedrm oceanview condo that was formerly listed on this VRBO site has now moved to VRBO #668800. Both condos now have listings of their own! Be sure to visit that site if you're looking for our 2 bedrm condo! Our condos are freshly remodeled with Seally Pillow Top and Serta Perfect Sleeper mattresses. They have fresh paint, new furniture, and flooring. These condos are exceptionally maintained by me, the owner! Your satisfaction is our priority! OUR RATES WILL NOT BE BEAT!!! We live close to Tybee Island, and enjoy visiting every chance we get! The beach is definitely our 'happy place!' We really enjoy staying in our condos because they are located in a nice, resort area with an on-site restaurant/bar. We always have a great time when we visit! We also love our guests, who rent our condos, and we work very hard to make sure we have 'repeat' rentals from year to year! Tybee Island is the 'Martha Vineyard' of the south. Tybee is small, friendly and quaint. It is close-knit and 'full of life' offering something for everyone!! Located 12 miles from Historic Downtown Savannah and River Street, it is very easy to enjoy the history and culture of Savannah, while staying on Tybee. You can stay very busy or just relax and enjoy the tranquility that Tybee offers! Best seafood, period! Best beach in the southeast. At high tide, Tybee has over 150 yards of beach! Our beach was totally restored in the fall of 2014 and the restoration process continues to take place almost every year ! Sheets, bath towels, hand towels, and wash cloths are provided. On first floor, but not at ground level. The parking garage is directly underneath the condos. The condo has a Mr. Coffee Coffee Maker and also a Keurig Coffee Maker. Brand new stainless steel appliances in kitchen. Added in 2015. Table seats 6 people and there are 3 barstools at the kitchen counter! Public tennis courts across the street! Pools are for guests staying in the Resort! Great condo, great location; will book this place again on my next trip to Savannah. Each year four of us enjoy a few days together at Tybee Island. We have stayed at several different places. This was our first time to stay at this condo. It was nice, comfortable, well equipped, and in a good location. Rhonda was kind and easy to work with. We hope to stay there again when we go next year. 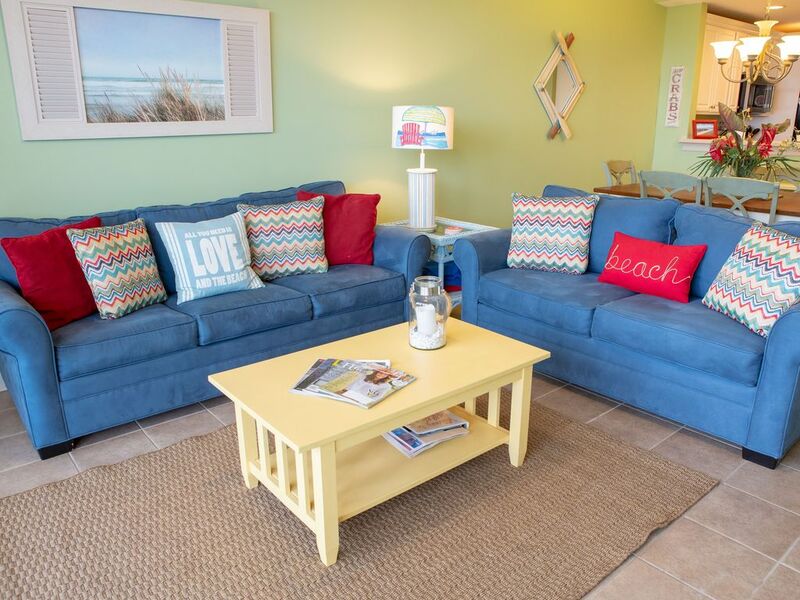 The condo was just beautifully decorated for beach time with plenty of space for us to be together when we wanted and separate when we needed. Close to pool and beach with parking right below the door. Rhonda was always quick with help when needed. This has become our go to place for visiting Savannah. You get the relaxation of the beach and can easily run over to enjoy all Savannah has to offer. We had a amazing stay! The condo was decorated so cute! very bright and colorful. It was very clean and well taken care of. We had everything we needed. The beach is right out the back door! I will return to Tybee Island and stay in this very same condo again! We really enjoyed our stay! Condo was really clean and met our needs perfectly. Condo is right on the beach. The only downside is the pool is really small, but there are 2 small pools and a kiddie pool. Restaurant right by the pool for pool side meals and drinks which was great. Rhonda was very responsive to all our needs!! Payment can be made by check or credit card. Mid Season rates vary according to month!